Pictured here at 22 months of age. Joey finished his Canadian title very quickly and with a Group placement. 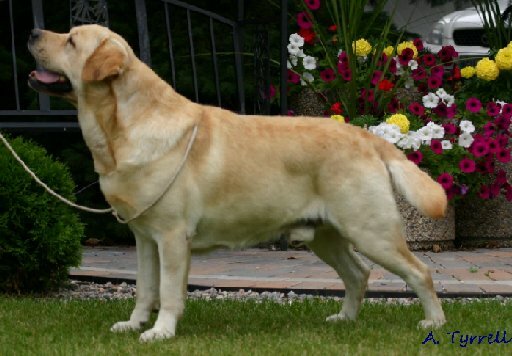 He is a very easy going boy with good breed type and strong, pure movement. Already points on his Grand Championship and proven. 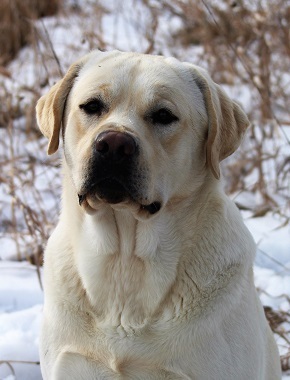 'Frankie' came to us courtesy of Pauline Mortier of Lubberline Labradors and Maryann Czerwinski of Broadway Labradors. He has proved to be a wonderful addition to our program and many breeders in southern Ontario have taken advantage of what he and his pedigree have to offer. 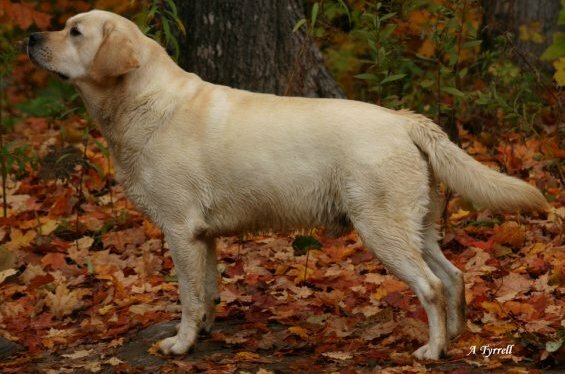 He is a properly coated, sound, smooth moving Labrador with the sweetest of natures. You always know Frankie in the ring as his tail goes non-stop! He truly is the worlds happiest dog! We have some lovely Frankie kids now hitting the ring AND winning! NOW RETIRED AND LIVING PRIVATELY-Enjoy your cottage lifestyle Franks!!!! Thank You Mrs. Hodge, Naiken Labradors UK!! "Pleasing head, eye and expression, good neck and reasonable front, deep mature body, good length, ample bone, tailset ok, good hindquarters and moved very well. RWD"
Thank You Mrs. Grannemann, Janrod Labradors USA!! "Nice dog. Great outline with good angles. Good bone right down through his feet. Pretty neck into good shoulders. Level topline into nice tailset. Good expression. Moves well. RWD"
*Proven *Sire of over 10 Can Ch's and field titled get! We are very happy with "Connor". 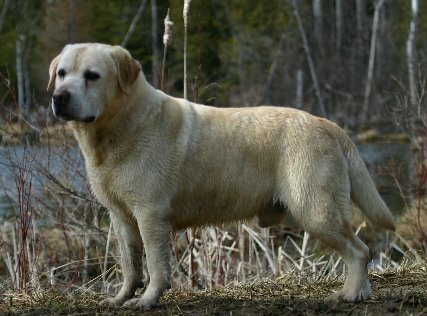 He is the lovely, sound, balanced Labrador who has produced well for us and others. He was shown sparingly and won a 4pt. 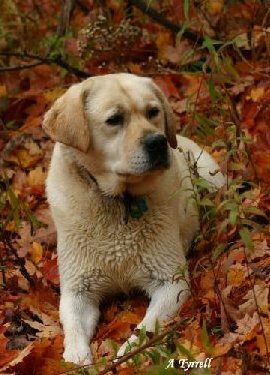 win under Mrs. Jane Forsyth as a junior puppy, a 5pt win as a senior, placed 2nd in the 12-18 class at the Canadian National Labrador Spec. under breeder/judge Mary Weist-Beechcroft and won the Bred-By class at the Eastern Ontario Lab. Breeders booster the next day under breeder/judge Bill Gugins-Beautawn Perm. Reg'd. He finished his Canadian Championship on July 1/99! 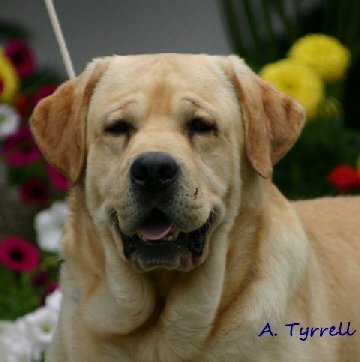 Connor is an UKC Grand Champion, Best in Show winner-UKC AND TOP UKC LABRADOR IN 2002! Hunted over regularly from 99-02. Across the Bridge now, likely woo-ing the girls and fetching ducks. 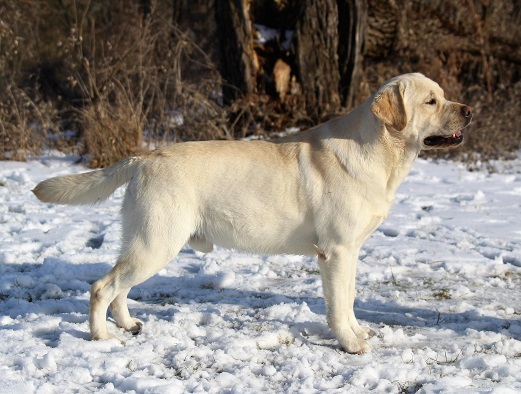 "11 year old in excellent order, masculine gentle head and expression, well made, good ribs and body, excellent bone and feet, well set tail, in good coat and still moves extremely well. JAM"
'Luc' is pictured here at 5 years of age. He had a terrific personality plus temperament and it showed in his good work ethic and confirmation. Luc had a 5pt, 4pt and 3pt win to gain his championship and was shown very sparingly. He is deeply missed.